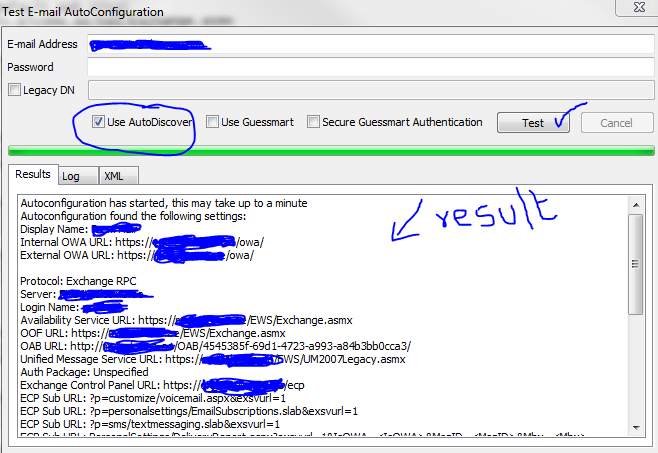 Select the “Use AutoDiscover” and click Test.. If this is not correct, you need to fix it.. This has to be done on Powershell command on the CAS server. Now you can see that the URL has been fixed. This is for Web Services. On the Middle top pannel, you can see the CAS server listed. Select one, on the bottom pannel, you will see like below. Select each tab and then right click on the object and change the path as required. Once you done with the first CAS servr, do the same for the second as well. Thats it…you are good to go for production. This was a tremendous help. For some reason when I set the directory to the URL, I left out the /EWS directory. I wondered why it worked on my other 2 Exchange servers and not the one I goofed on. Thanks again, you saved me many hours of frustration. Additionaly, I start seeing some sort of autodiscover issues not using HTTPS, but rather HTTP, which fails of course because Require SSL is set for /autodiscover virtual directory. Thanks for the post..it was very helpful and informative. This article was a great help to me. Thank you! This is great yet simple checklist approach to how Exchange 2007 and 2010 should be configured for co-existence. Thank you for posting this. It really helped me get my EWS working!